“Be who you are and say what you feel because those who mind don't matter and those who matter don't mind." This post has the likelihood of turning out long, self-indulgent and wordy, so if it does, please forgive me/don't say I didn't warn you. Since becoming interested in blogging five or so years ago, I've continually struggled with "finding a fit." I started on Blogger, moved to Wordpress, moved back to Blogger. I've used my name, a nickname, a psuedonym and now a piece of a quote for a blog name. I've made resolutions, broken promises to myself and through it all worried about the number of followers I have, the number of comments I receive, and the (assumed) lack of interest from the blogging community in what I have to say. There are a lot of blogs out there. A. Lot. I know; my Google Reader's consistently glaring more than 1,000 unread posts. Some bloggers seemingly have it made. They are known. And they are fantastic and totally deserving of what they've achived. But that annoying little voice inside my head—the one that makes me feel fat when enjoying a delicious meal, ugly when I thought I was wearing a cute outfit, not funny even though I made a good joke—sees these bloggers and wonders why they have what I don't. In the long run, I know, it comes down to putting the time and hard work in. Commenting and sharing and sponsoring and making connections. But you know that little voice. It likes to be a nudge. And it's hard not to listen when you're already struggling. Most popular blogs seem to have an underlying theme. Be it crafts or inspiration or geekery or vintage—the bloggers of these blogs stick to one topic and expand upon it. They then make connections with other bloggers who post similarly. What happens, however, when you are interested in all of these things—and more? I'm weird. I know this. I revel in this. My tastes are all over the map. I love going to Comic Con and watching SyFy and finding (and sharing) all the dirt on the latest superhero movies. I love curling up with a good book, be that "good" like Twilight or good like 1984. I love pretty flats and purses and dresses and nailpolish and have an unhealthy obsession with Urban Decay's Midnight Cowboy eyeshadow. I have more than eight pairs of Chuck Taylors and a massive collection of t-shirts, many of them from the little boy's sections of Old Navy and Target. I love to crochet and stencil and sew. I once wanted to be an astronaut, and when I was a little younger than that, a fashion designer. I fantasize about going back to school for Library Science, but worry that adding that to my English and Journalism degree wouldn't be smart for my future employment prospects. Working with HTML and CSS excites me, but I would kill to get to be a window dressing/store design intern at Anthropology. I love playing with the design of the apartment I share with my husband and our dog (who is, yes, named after a Harry Potter character); that design ranges from Star Wars posters and toys in the kitchen to a CB2 duvet cover tacked to the bedroom wall to hand-stitched pillows on our couch. I dabble in graphic design while working a day job as a writer/editor. It all gets pretty darn convoluted. You can see that I like a lot of things. So what aspect of my personality do I choose to focus my blog on? I love them all equally, and want to showcase that. I know it's been quiet around here on the crafting front, but that's in part because most of 2010 was spent planning a wedding. But focusing only on the things I make would cut a large portion of the nerdier parts of my life out, and it's so very important to me to be a nerd. All this to say that I think I'm finally coming to terms with the fact that I'm never going to have a cohesive "theme," unless that theme is "Mandy." Which might make it hard for me to find a place in the blogging community, but I'm also coming to terms with that. I want this space to be special. For me and for the people that stop by to check it out. There might not always be something for each individual, but that's OK with me. A new year is always exciting. 2011 is overflowing with possibility. I'm not going to make any resolutions, but I will make a pledge to you, my friends, to keep up the good work and strive to be better. To post more often, and to blog more about the many different sides of me. To share with you who I am and what I love. I hope you stick around ... and pass the word about this crazy blog along from time to time. Thank you for believing in me, and therefore helping me to believe in myself. i love this post! i feel you on so many of these issues (i've literally said to somebody that my dream job would be a window dresser at anthropologie - that would be lovely). and let me say that going to library school is awesome - i graduated 4 years ago and i love being a nerdy librarian! Coincidentally, this is why I used to have 3 blogs - trying to stick to one theme for consistency's sake. It just didn't work. I wanted something I could just post on, something that wasn't so much work. So, I combined them all, and life has been easier/better ever sense. Good for you for being yourself, across the board. "But that annoying little voice inside my head—the one that makes me feel fat when enjoying a delicious meal, ugly when I thought I was wearing a cute outfit, not funny even though I made a good joke—" -Makes you feel like a leper when you're wearing awesome leggings? 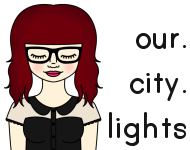 My first thought when I read the our.city.lights post was, "Awesome! Mandy's famous. I know a famous person!" But aside from that this is an excellent post. Write about what you love, even if it's all over the place. I like reading it. Even the girly stuff. Coincidentally I was just thinking this morning I need to introduce a friend of mine to Nerd News because he's a big dork like us and he would probably love it. Keep up the good work, lady. It gives me something entertaining to read during the work day between pages of Axe Cop, Dr. McNinja and Cracked articles. Hey! i'mma new reader here... found you from our.city.lights and now that i've gone back and read some of your older posts... GIRL you just instantly became one of my top 10 blogs to follow. Seriously. Not kidding. LOVE YOU BLOG! can't hardly wait til i get home after work so i can read MORE of you back-posts! As i was reading you post for today and your description of yourself i began to wonder if you are my doppleganger?!?! it's amazing to feel such an instant involvment in a blog that's so "new" to me. I'm tickled pink! Keep up the random awesomeness... love it! Wow so, Mandy, I did find you through Diana and I'm already in love with you (in a completely platonic, nerdy love kind of way). When I saw that your dog was name Mollie Weasley... well that's when you had me. Question - where is your Battlestar stuff?!?! Also... here are some Star Wars travel posters, by a friend of a friend. You, darling, are amazing. I love how you can be so many different things and are interested in so many different things. I love how you show me your world and what is important to you. I love your quirks. I love the interesting little tidbits you represent. You are wonderful and I think this blog is wonderful. Remember, everyone started with just one follower. And like you said, all it takes is commitment and hard work. I would like to leave you with a little line from a little movie from a long time ago. "If you build it, they will come." Keep at it Mands, you are too spectacular to be ignored. All I needed to hear was "Library Science" "Harry Potter" and " I love curling up with a good book." I plan to stick around. Hmmm. I know what you're saying. Completely, actually! I'm not very crafty, I don't have an epic job and I'm a college student who is experiencing most of the same things that other college students are. I don't have a boyfriend to brag on, and I don't have cute kids to showcase! But I figure, I'll write/post on whatever comes to mind, and it will just "be." After all, that's why I started blogging in the first place, right? I just discovered your blog when PerryPie sent me over here, and I completely love it! It makes me feel a bit better about not fitting into one niche too. You always have such lovely and funny posts, and I'm constantly checking your Nerd News, mostly because, well, it's awesome! So from us who don't fit one niche, thanks for not fitting in too! It's more fun to stand out in chaotic uniqueness. i resonate with your feelings completely. i myself am extremely new [like, a little more than 3 weeks new] to the blogging scene, and it's all a bit overwhelming! i constantly struggle with what i'm writing [is that what i want to say? is that how i want it to sound?] and writing about what really matters to me. i also found your blog through our. city. lights., but i must say - i do love it! Mandy! I think you're great. I am a new follower (and baby blogger) and I think that you rock your interests right tight, and those of us who identify are jumping into your boat! Keep on Sister, I'm sure that expressing your genuine, lovely, multi-faceted self is going to be the road to your success. I think it is harder for bloggers who write a little bit about everything to find their niche. It affects the type of readers you attract, and also the content you put out. "Should I blog about this topic or not?" "Is this a fit for my blog?" In the end, I think an ecletic blogger can be just as "popular" as a niche blogger. Keep doing what you are doing, because it definitely works!